You've probably all heard the urban legend regarding telemarketing agents who are told to smile while on the phone with customers because they can hear it and, hence, are in a better mood to buy whatever is for sale. I have no clue whether that is true or not but I'm sure about one thing: every time I'm on the phone with my girlfriend I can tell whether something bothers her or not. I'm pretty sure I'm not the only one who's had such a sensation, am I? From this it follows that you can actually tell the mood of a person from his/her voice, right? But feelings are also showed very clearly through our facial expressions, for instance, a smile means joy, tears express sadness and frowning communicates rage. Well I claim this also applies the other way around and facial expressions can induce a mood! You don't agree with me? The next time you are happy as a lark, force yourself to pull a long face in front of the mirror and see how long your happiness lasts. And when you are feeling down, try the opposite and smile! You won't notice it right away and you certainly won't be ecstatic in the wink of an eye, but I guarantee your slump will be shorter. The moral of the story is that you can put this phenomenon to practice when recording vocals. 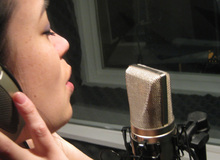 In order to transmit the desired emotions more easily, the singer might try to adopt a corresponding facial expression at given moments of a song. This can help him/her get into the right mood every time and reflect this in his/her vocal performance. The singer will be a bit wary at first but, trust me, I bet he/she will realize soon enough that it does help him/her to get into character, improving the overall vocal performance. Personally, for the toughest cases I use a small trick that consists in adding notes right next to the lyrics (on the copies I told you to print out two weeks ago), highlighting the desired emotions that ought to be conveyed. It's dead easy, and it works. I know that, usually, the singer doesn't need all this, especially if he/she wrote the lyrics him/herself. But do consider that recording in a studio is not exactly a situation that everybody would consider "natural." Musicians who are not used to the drill might get upset relatively fast during the takes. And these small tricks can really make a big difference. Besides, they don't take too much time to put into practice, so why deprive yourself from the advantages?